The story will borrow many of the familiar beats from Connor’s origin, but it will tweak them to play with audience expectations. This will be a little longer than your average treatment, with fully realized scenes to illustrate the kind of story I’d like to see. I’m going to spend more time on the setup, treating this like an origin story, then I’ll give you a flavor of where it’s going. The story begins in the late sixteenth century, in the highlands of Scotland. Members of the clan MacDonald morn the loss of their brethren at the hands of the MacLeods. They find guidance in a persuasive outsider. A titan of a man, he claims his name is Tavish MacDonald. Few doubt his right to kinship, especially when he proposes a campaign of vengeance against the MacLeods. Leading the MacDonalds through Ardmore Bay, Tavish sets out to purge the land of holy ground. He instructs his men to set churches ablaze with the parishioners trapped inside. Kendrick MacLeod is a shepherd, who strays from his herd to write romantic poetry. Abandoning his chores, he reads his compositions to his fiancé Jonet. When news of the atrocity of Ardmore Bay reaches the clan, Kendrick is enlisted to fight by his father Graham MacLeod. Promising his fiancé he’ll return, Kendrick follows his kinsmen into battle. The clan’s scouts report the sighting of a camp sight in the valley of Glendale. A terrible nausea comes over Kendrick. He falls before the arrows strike the men beside him. Crawling into the shrubs, Kendrick watches logs roll down the hills to flatten his kinsmen. A warrior on horse back, cuts the last of the Macleods down, like he was reaping wheat. This is Tavish in blood red war paint. Writhing in the underbrush, Kendrick watches the horsemen leap off his steed. Tavish closes his eyes to feel the wind between his fingers. Waving his sword, Tavish follows a magnetic pull toward Kendrick’s hiding spot. Terrified, Kendrick freezes long enough for Tavish to close the distance between them. 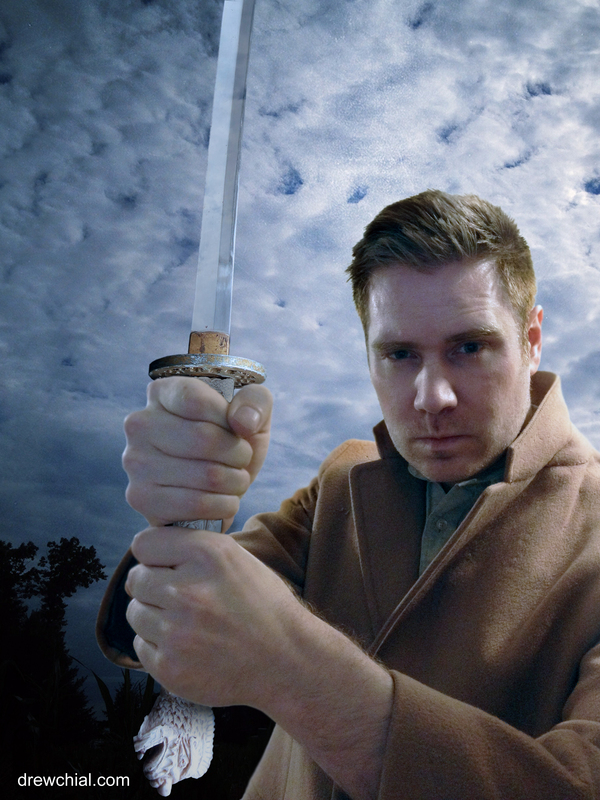 The blood drenched warrior drives his sword through the poet’s chest. Kendrick doubles over, Tavish raises his blade to claim his target’s head. Up on the hill, Graham slices a rope, turning one of Tavish’s log traps against him. Buried for but a moment, the warrior discards the pile of logs with the ease of a bed sheet. 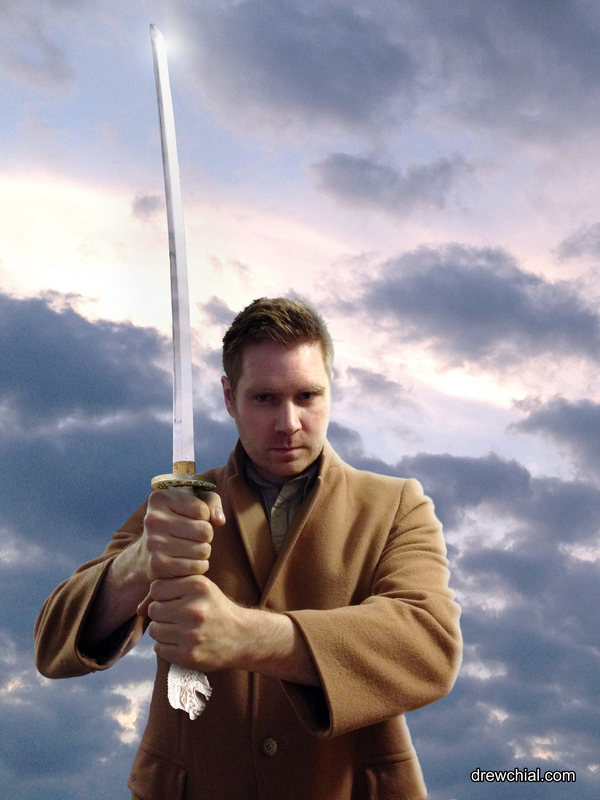 Wrenching himself off the ground, Tavish rises into Kendrick’s blade. It separates the warrior’s head from his body. Clutching his wound, Kendrick falls to the valley floor. Little does he know he’s beheaded the oldest and most powerful immortal ever to walk the earth. 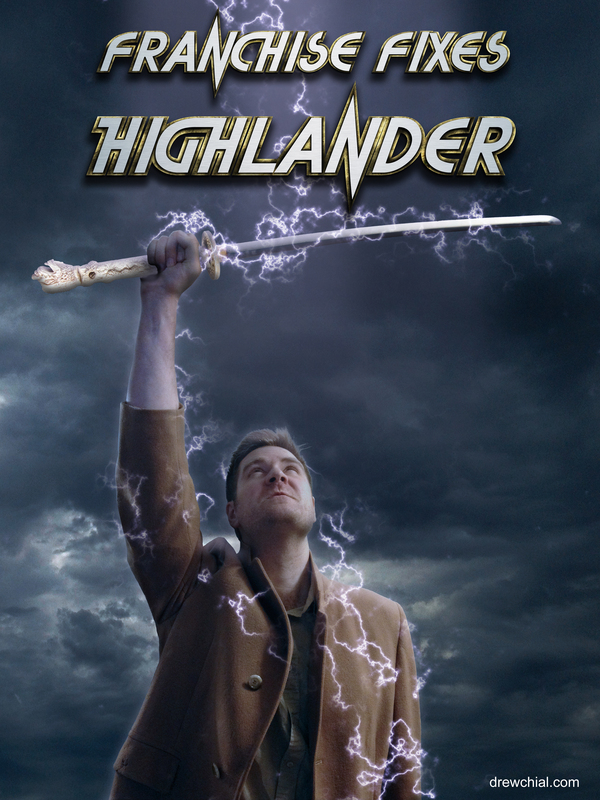 A lightning bolt lifts young MacLeod into the air, hurling his kinsmen’s bodies across the camp. Electricity chars Kendrick’s kilt to cinders, singes his locks down to his scalp. Mortified, Graham watches his son get sucked up into the clouds. Kendrick wakes to the sound of his bones collapsing back into his body. Flecks of ash blow away, revealing a clean layer of skin beneath. When Kendrick staggers back into the village, naked and confused, his family is convinced that he’s not the same man. Though his flesh has healed, his hair is a patchwork of loose ends. His eyes have gone dark, and his face has lost its kindness. Kendrick doesn’t believe his father’s theory, until he wakes in the forrest, with a storm raging overhead. Following her fiancé’s footprints, Jonet tracks him into the woods. Graham follows close behind, careful to stay out of sight. Jonet calls out for Kendrick. She spots him wandering barefoot. Turning to the sound of her voice, he’s struck by lightning. Running to put out Kendrick’s smoking garments, Jonet is surprised to find him unfazed, muttering about an elk. Jonet thinks her fiancé has gone mad, until they discover an elk in a clearing, its hoof trapped beneath a downed tree. Kendrick lifts the trunk, with the same ease that Tavish had with the logs. Graham MacLeod watches from his perch in the trees, horrified to find his suspicions confirmed. Men come to shackle Kendrick in his sleep. Even with his head in the stocks, it takes half of the clan to drag him into the dungeon. When a witchfinder arrives from the lowlands, the hairs on Kendrick’s arms stand up straight. The queasy sensation from the battlefield returns. The witchfinder has Kendrick burnt at the stake. The fires cook off several layers of skin only to reveal a fresh one beneath. The witchfinder convinces Graham that Kendrick must be beheaded. Graham volunteers to be the one to deliver the merciful blow. The witchfinder insists he carry out the task himself, for it’s the lord’s command and he is the lord’s instrument. Taking advantage of the argument, Jonet breaks Kendrick out of the dungeons. The witchfinder corners them on the way out. Defenseless, Kendrick counters the mad monk’s attacks with new found speed and agility. Disarming his opponent, Kendrick compels him to yield. The witchfinder lunges at him with a hidden blade, ignoring the sword piercing his heart. With the man of God’s blood on his hands, Jonet urges Kendrick to flee. Neither of them stay to see the witchfinder pull the sword from his chest. Jonet knows of an abandon castle in the lowlands. The pair sneak into the village to steal supplies, when the witchfinder rings the bells. He corners the lovers, instructing Kendrick’s kinsman to bind their wrists and ankles. Kendrick pleads with his father to spare Jonet, going so far as to announce that the witchfinder is an immortal like himself. Kendrick has his mob’s attention, until he’s hit with another surge of nausea. An eccentric stranger, in opulent dress, flings explosive powders into the crowd. Cutting Kendrick’s bindings, the stranger tells him to follow. Kendrick takes Jonet’s hand. Making their way to the stables, the trio flees on horseback. The stranger leads them to the abandon castle, where he’s already setup camp. Jonet dismounts, oblivious of the muck at her heels. Kendrick remains on horseback, weary of the eccentric Italian, and his dragon shaped hilt. Dante mentors Kendrick, preparing him to take on Roxate. His training regiment takes them across the Scottish countryside. Dante speaks in parables, drawing life lessons from his many lifetimes. Kendrick catches him altering stories that he’s already told, exaggerating his adventures with each telling. Building a bonfire, Dante challenges Kendrick to jump through it. Dropping his sword in the middle of a lake, Dante challenges Kendrick to retrieve it. The pair take turns leaping from a tall spire, seeing who can jump the furthest. Jonet returns to discover a blood trail into the castle. She follows it to find her men, their clothes reduced to tatters, singing a drunken shanty about the fall of Icarus. Immortals do not fight on holy ground, for fear of being struck down. This is the reason Tavish had the MacLeod’s churches burnt down, so Kendrick would have no place to take refuge. Only one immortal can challenge another. Throughout their sparring, Dante is surprised to find Kendrick can match his speed. Despite the weight of his cumbersome claymore, Kendrick meets Dante’s katana strike for strike. The tone of their training shifts, as the pair draw blood. They take turns counting aloud how long it takes for the other to heal. Dante is shocked that one so young could heal so quickly. Exploiting Kendrick’s poor footing, Dante drives his student over the edge of a cliff. With his apprentice climbing up the rock face, Dante confides in Jonet. He tells her that Kendrick, like all immortals, will never be able to give her children. He begs her to leave, to spare her fiancé this humiliation. Dante sends Jonet away for supplies. He implores her to think about whether or not she actually wants to return with them. Kendrick scales the cliff to find his fiancé is gone. Dante uses this opportunity to reveal the opponent he’s been preparing Kendrick to face is himself. Kendrick accuses his mentor of training him to assess his weaknesses, to develop a technique that he could never match. Jonet watches from the shrubs that border the grounds. She didn’t leave after all. Dante lunges at his pupil. They cross blades. Dante slices Kendrick’s throat. The young Highlander reveals how much he’s been holding back. Hitting his master with the broad side of his sword, Kendrick sweeps Dante off his feet. He has the opportunity to claim Dante’s head, but refuses. Dante pierces Kendrick’s stomach. He falls to his knees. Before Dante can land the killing blow, Jonet bashes him with the dull side of the claymore. Dante kicks her in the stomach. She rolls down across the ground. Dante readies his blade to find his pupil has vanished. Kendrick moves into Dante’s stroke, pries the katana free, and uses his master’s momentum to claim his head. Sparks shoot from Dante’s neck. His headless corpse bows to his student. Kendrick is hit with an arc of electricity. The grass catches fire around him. The quickening levels the castle to the ground. When the lightning ceases and the smoke clears, Jonet crawls out of hiding. Sifting through the rubble, the pair gather what supplies they can carry, and trek into the valley below. As you can tell, my imagination has been trekking across the Highlands of Scotland for some time. It makes it difficult to summarize the story without it reading like a police report. That said, this pitch is going to need another entry. I dare you to make part 2 in present day Glasgow! Could be awesome.